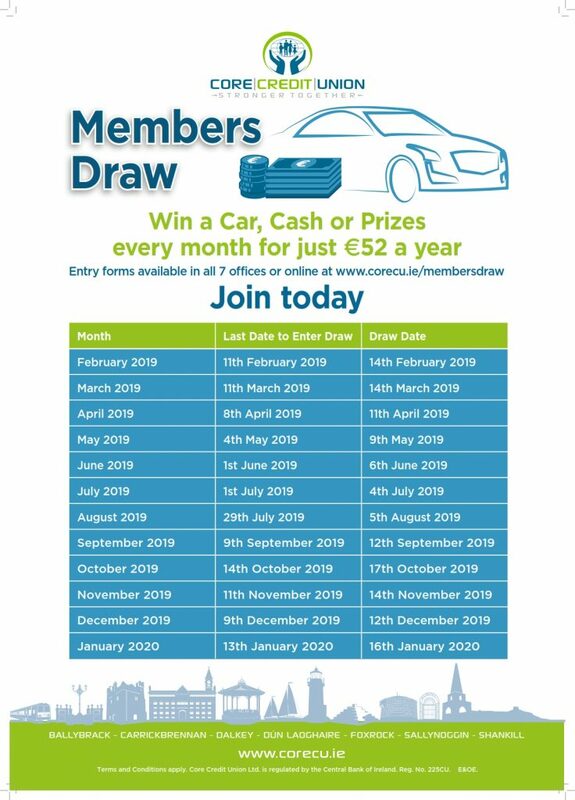 The Core Credit Union Members Draw – Win a Car, Cash or Prizes every month for just €52 a year! One entry is allowed per Member and in the case of Joint Accounts the prize will be awarded to both Members of the account. Clubs / Society & Community Group accounts may enter the draw and in the event of such a group winning, the prize will be awarded in the group’s name. The draw will be an ongoing project, subject to sufficient Members subscribing to fund the purchase cost of the prizes. The draw is self-financing and non-profit making. Should there be a surplus it will be disposed of by way of extra draws or competitions to draw Members. Winner’s name will be made public, with the winner or their representative required to attend a photo shoot – to be used for publicity purposed and on social media, print media, in-store advertising and our website. How do I enter the Members Draw? To be in with a chance to win a Car, Cash or Prizes every month, click on the link below, print out the entry form and hand in the completed form to a member of staff in any of the Core Credit Union offices. Participation in the draw is valid once written authorisation is received, by completing the entry form below and handing it into staff of Core Credit Union. Members seeking to exit the Members Draw must complete a Members Draw Cessation Form, which is included in the form below. The draw is open to Members of Core Credit Union, aged 18 and over at the time of the draw. For a full list of the Terms and Conditions, click on the link below.